Summary: It is Whitaker's portrayal of the former Ugandan President that's the stand out feature of this film. I went to a lot of fundraisers during my time at university. The purpose of these nights, which if you were lucky would feature both a crap band and a raffle, was to help pay the costs of some fellow students while they spent a summer doing voluntary work in a third world country. Being the misanthrope that I am, I could never shake the feeling that I was paying for them to go off and have an adventure while I was left in boring old Scotland. Of course, many students have genuinely altruistic motives when setting off on such a trip, but deep down I suspect most are doing it for the “experience”. That would certainly seem to the motive of Dr Nicholas Garrigan (James McAvoy), the lead character in The Last King of Scotland. Fresh from university, he’s drowning in dreary 1970’s Scotland, particularly the expectation that he’ll follow his father into family medicine. He wants to escape, it doesn’t matter to where, so he spins the globe, planning to go wherever his finger lands. Where does fate want to take him? Canada. This destination doesn’t get Dr Garrigan excited (far too many Scots probably) so he spins again and this time gets the exotic option he was hoping for – Uganda. The dusty African landscape is a vast departure from the rain-induced greyness of Scotland, and congratulations and awards should go to cinematographer Anthony Dod Mantle for his skill in bringing this to the screen in such a vibrant way (something to do with using 16mm cameras and then blowing up a strip of the film, according to the director Kevin Macdonald). Certainly the film achieves much on a visual level, though one scene did stick in my craw; Garrigan playing a game of football with some young boys could have come out of some promo video for Gap Year Inc. But let’s not dwell on this. The Last King of Scotland does not try to give a complete account of life in Uganda during the rule of one of history’s most infamous dictators. Rather it places the relationship between Amin and Garragin is at the centre of the film. The two meet when Garragin treats Amin (Forest Whittaker) for an injured hand and bond over Scotland – Amin thinks it the second finest nation in the world, after Uganda of course. Garragin is subsequently invited to become his personal physician, a position which he initially turns down in favour of continuing his worthy work in the countryside (and trying to get into Gillian Anderson’s knickers). But the lure of lavish parties filled with beautiful women that comes with a government job, and the charisma of Amin himself, wins Garragin over. And for a while, life is good. There’s as plenty of wine, women and song, and his boss, though eccentric, seems to be determined to make his country a better place for its citizens to live. But, of course, there was another side to Idi Amin, and it takes some time for Garragin to become aware of this. The character’s naivety is, on a certain level, incredibly frustrating to watch but is justified within the confines of the film by the combination of an MTV lifestyle, the arrogance of Garragin and the almost hypnotic power of Amin. 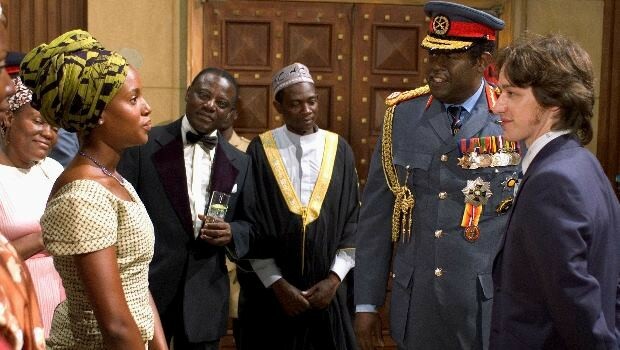 It is Whitaker’s portrayal of the former Ugandan President that’s the stand out feature of this film. Swinging with ease from laid back charm to righteous indignation, or from deep frustration to all consuming rage, he is terrifyingly convincing in the role, and while the film is successful in its own right, Whitaker’s performance makes it essential viewing.